What a great and crazy weekend! We've run errands, we've grocery shopped, we've readied the church for Easter service and we've managed to relax! 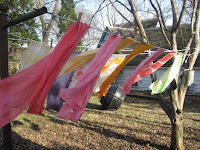 Saturday the children and I dyed silk scarves in Easter egg colors instead of trying to dye our beautiful brown organic eggs and having too many hard-boiled eggs around. It was a great project, both children enjoyed their creativity and one inspired by my friend Verda in Little Rock. She was inspired by The Rowdy Pea and when I got ready to do it this is where I found the easy and exact directions. Here is another great site that recounts their dyeing experience. I did get some knitting done(just about finished with the white washcloth) and since I did not make it to the library on Saturday amidst all my other errands, I pulled a book off the pile of to-reads-eventually by my bed. I chose I have lived a thousand years; growing up in the Holocaust by Livia Bitton-Jackson. I purchased this book a few years ago in DC at the Holocaust Museum. After reading The Devil's Arithmetic a few of my fifth-graders in our multicultural book club are interested in the Holocaust so I thought I would read this and pass it on to one of them. I've read five chapters and am impressed with how well it it written. The author writes a lot about her early dreams of becoming a poet; the one object she smuggled out of the ghetto was her poetry notebook. The dishes are done, my son wore a tie today and the Easter Bunny brought good peanut butter treats and black jelly beans!! The meal my mom and I prepared together was delicious. The day is done.